Wow! Awesome footage and beautiful pictures. How long do the mountain lampreys live after spawning? These were all amazing to watch. Love the photo of the stream too. The sunlight shining through the trees on it is really nice. Makes me want to be out in the water. Thanks for sharing. Hellbenders are neat animals. I've seen a few in western North Carolina where you would not suspect them. I accompanied Todd on parts of his trip...actually if I remember correctly maybe a day or two at the end of his journey. We enjoyed several sites loaded with Tangerine Darters fluttering in a liquid breeze and a beautiful headwaters stream inhabited by Tennessee Dace in several plunge pools. I soon departed and met up with the Freshwaters Illustrated crew as they filmed River Chub nests in the smokies over the Memorial Day weekend. And this was my first experience with liquid sunshine…. A short video clip of this nest can be seen here. What an all around gorgeous place. On my route home, I stopped again to play with more Tangerines to discover a Whitetail Shiner party. What are these tubercles for? A series of stills from this battle can be seen here. I like how you put that Michael... Photography, not taking pictures. Lance's work is getting absolutely amazing, isn't it? I am learning a ton from him. Edited by farmertodd, 01 September 2011 - 04:10 PM. Nice photos, Lance! That's some snoody gear involved right there -- I love the crayfish spectator on that last Cyprinella photo. That is an awesome idea. Casper, we should add that to the store. I want 2 already!!! Lance is a young master. I do not recall ever seeing the orangish fins on a Whitetail Shiner and i have seen a lot in breeding mode. Never seen 4 in a vigorous biting tussle though. Are we 100% sure those are Whitetails? Their bodies tell me so but the color is really throwing me. Perhaps a regional variation? Map 138 in Petersons shows the seperate and mysterious population on the other side of the Mississippi but you were in TN i believe. I wonder if Lance manipulated his color correction much? The breeding males in my area are all very pearlescent... but that orange red is confusing me. Regarding the calendar suggestion, i have thought a calendar would be appreciated by a few of NANFA's members but not enough to justify the time, expense, printing quanity needed and then a very limited shelf life. NANFA items have not been selling well these last few years and we still have a lot of the wonderful Virginia shirts that Lance's father illustrated though we only printed 75. And i think it is one of the best NANFA shirts printed. Not much motivation for me to add more items. We certainly have plenty of wonderful pictures to pick from. The real goal would be to publish a NANFA logoed calendar that would be available to the general public like at Barnes and Nobles, Books A Million, etc in their calendar racks during the holiday sales season. Tapping into those distributers would be challenging but enlightning to anyone in the general public who picks one up. I do see tropical fish calendars, those tropical folks would be impressed to see what is living here under their noses! Someone care to chase the idea? It would certainly bring more awareness to our native fishes and to NANFA. It seemed to be more of a gamble for water clarity, but there are many miles to explore in the Emory River next spring. I still can't get over the tangerines at Clear Creek. Just couldn't photograph them. Where do the tropical fish calendars get sold? I am thinking they might get good sales of they were advertised in fly fishing magazines. I wonder what a small ad for a non-profit might cost? Or perhaps we could pair up with TU somehow? I would certainly be willing to buy several calenders to distribute to friends and family, or put up at work. Maybe even some info. printed on the page along with each picture to help inform about the 'fish of the month' would be an inviting way to educate. I know printing can be quite costly though. Maybe we could do a pole or something to find out how many members would be interested in purchasing calenders? With all of the beautiful pictures I've seen at this site, how could anyone ever pick out only 12 each year? I've seen them with orange on distal portions of their fins but never with this saturation. I'm unsure I've experienced them this fired up before though - red noses were new to me as well. Man Todd, that's how I felt that entire day. Stupid 4wheelers in mass. Todd tried showing me the elusive Olive Darter and after several minutes flipping rocks getting mere muddy glimpses as they skirted through the sediment plumes to the next rock cavity, I gave up. Several days later, after I began losing light from the developing clouds and completed exhausted myself with the Whitetail Shiner party, I pushed myself downstream of the riffle with intent of going home to find Olive Darters swimming around...everywhere. I still wonder what changed... What time of day was it that they were out like that? It wasn't any time that we hadn't been there before, right? I hadn't had a chance to see this picture yet. Vahry nice-ah! Same time period we were there days earlier - middle afternoon. It clouded up big time though. If you could see the EXIF data for that picture...it was dark. This is amazing. Now you have me thinking, which always proceeds spending money. Awesome photos and videos guys! I would love to get to see those species someday. You guys are really raising the bar when it comes to documenting our native fishes. I do not recall ever seeing the orangish fins on a Whitetail Shiner and i have seen a lot in breeding mode. Never seen 4 in a vigorous biting tussle though. Are we 100% sure those are Whitetails? Their bodies tell me so but the color is really throwing me. Perhaps a regional variation? I ran across this comment. 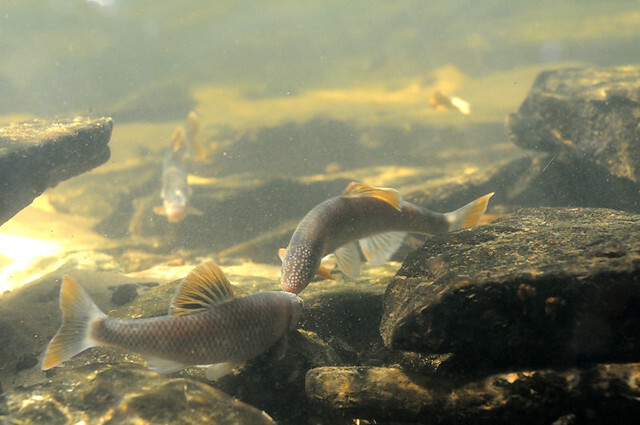 Note that the scientific name was a little different back then, but we are talking about the same fish Cyprinella galactura the whitetail shiner. Photogenis galacturus (Cope) Jor. Very abundant everywhere in the Cumberland. Some specimens from Nashville have the caudal fin pale red. So the old guys in 1878 knew about this reddish tint on some whitetails. Lance, I didn't follow all the geography in the thread. Could it be said that the place you were at was from the general area of Nashville?